Baby, it's cold outside! At least, in most parts of the country. And our pets feel it just like we do. In this column, The Early Show's resident veterinarian, Dr. Debbye Turner Bell, shares tips to help you keep the deep freeze of winter from getting the better of them. Bone-chilling temperatures are dangerous for people and animals, alike. 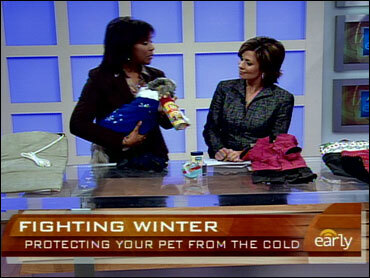 It's especially important during the cold months to take precautions to keep your pets warm and safe. All outdoor pets should have shelter from the wind, rain, and snow. When the temperature drops below freezing, we should provide adequate protection from the elements for our pets. When the outside temperature and/or wind chill drops below zero, then our pets should have access to shelter that has heat! Young pets don't regulate their body temperature as well as adults, so bring them inside when it gets cold. Also, older pets, or pets with illness are especially susceptible to the cold. Keep them inside with you. The Humane Society of the United States recommends that short-haired dogs not be allowed outside for extended periods of time if the temperature is below 20 degrees F. And old dogs shouldn't be outside when the temperature drops below 40 degrees F.
Normal body temperature for a dog or cat is around 101 degrees. Hypothermia happens when the animal's body temperature falls dramatically below that. The metabolic rate lowers and, as a result, affects organ functions. The first sign of hypothermia is shivering, then respiratory depression, lethargy, weakness, gums turn pale or bluish, lack of coordination, paralysis, and collapse. Hypothermia is a serious condition. Left untreated, it can lead to, complicate, or cause coma, heart disease, and kidney failure. If you suspect your pet is suffering from hypothermia, wrap him in a warm, dry blanket and get her to the veterinary clinic immediately. Frostbite is especially a risk for pets, because it's easy to miss under the fur. Frostbite is the death of tissues in the body caused by ice crystal formed in cells. The parts that are most likely to get frostbite are the ears, feet, tail, scrotum, and mammary glands. If conditions persist, the skin will begin to slough off. Again, immediate medical attention is necessary if you think your pet has frostbite. Pets may need extra food in winter so their bodies will have more fuel to keep them warm (indoor pets might eat less, since they're less active). So don't be surprise if Fido asks for second helpings in winter. Give them to him! Plus, pets need access to fresh, unfrozen water at all times. It's better to use a heavy plastic water bowl in the winter than metal. Metal loses heat quickly and the water will freeze faster. Plus, there's a chance the dog's tongue could get stuck to the bowl. A heated bowl is best for outside dogs. For their daily walk, put a sweater on dogs with short or thin hair. Dogs that should wear a sweater include older (geriatric) dogs, short-haired dogs (such as Chihuahuas, miniature pinschers, dachshunds, greyhounds, boxers, and Boston Terriers), and dogs that are sick. Ice balls can form around your dog's feet or between the toes. These can be painful. Clipping the hair around the feet will help reduce this. Plus, try apply a little Vaseline or cooking spray on the bottom of the feet before a walk to keep ice and snow from sticking. Make sure to wipe the dog's feet when she comes back inside. Salted roads and sidewalks can be irritating dogs. If their footpads are cracked from the cold weather, the salt will literally be like "salt in a wound." Not fun. Plus, you don't want your dog licking all that salt and swallowing it. Be sure to wipe off your dog's feet when she comes in from a walk. Booties are very helpful in keeping the dog's feet dry, and clean off salt and other chemicals. Of course, it may take some time to teach your dog to wear them! Be careful not to let your pets get too close to the fireplace and space heaters. Burns aren't uncommon at this time of year, as pets can accidentally knock over heaters or get too close to open flames. For a proper doghouse, the shelter should be elevated off the ground, insulated, wind-tight, and water-proof. It should be large enough for the dog to stand and turn in a full circle. And that's all. If the shelter is too big, the dog's body heat won't be able to help heat the doghouse. Of course, the bedding should be clean and dry. If you use an old blanket or quilt as bedding, be sure it stays clean and dry at all times. Wet bedding can only make matters worse for your dog. Some suggest that you use fresh hay as a bedding in doghouses. A good six-to-ten inch layer at the bottom of the house should be enough to keep the pooch protected from the cold underneath. Doghouses should face south or east to protect the pooch from the wind. It's best not to use heat lamps or space heaters in a doghouse. There is a high risk for burns, if they're left on too long or too high. Antifreeze poisoning is a big risk during the cold months. This is a life-threatening medical emergency. If your dog or cat ingests antifreeze and receives no medical attention, they could die in less than a day. Signs of antifreeze poisoning: depression, lack of coordination, diarrhea, thirst, and seizures (ethylene glycol is the toxic agent. Antizol-vet can be given to stop the effect of the ethylene glycol) There is a safer antifreeze that is made with propylene glycol that doesn't damage the kidneys, but it is still toxic and can damage the nervous system. If you have an outdoor cat or the neighbors have outdoor cats, knock on the hood loudly before starting the engine. Cats will crawl into the engine to keep warm. Starting the car with a cat in the engine can be devastating. Cold weather dogs can tolerate more cold than other dogs -- cold weather dogs such as Huskies, Samoyeds, Chows, St. Bernards, Sheepdogs, Bernese Mountain Dogs, and Great Pyrenes.